ILYTB | What Does ILYTB Mean? 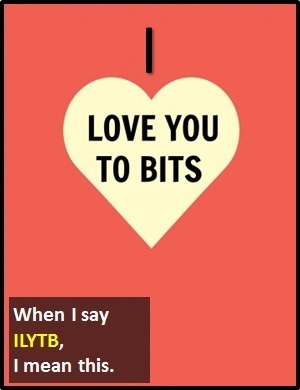 ILYTB means "I Love You To Bits". The origin of "I love you to bits" is unclear. ILYTB is typically (but not exclusively) used in a casual way (i.e., often between friends or family members). It has a playful connotation and so would not usually be used in a serious scenario (e.g., gazing into a partner's eyes over a candlelit dinner). ILYTB (I love you to bits) is considered a casual way of saying I love you. Person A: I ILYTB. I'll catch you later. Person B: Okay, bye for now. Person A: Thanks for helping with my assignment. ILYTB. Person B: Glad to help. Of note, ILYTB is an initialism abbreviation. Technically, this means it is pronounced using its individual letters (i.e., Aye El Wye Tee Bee), but as this is harder to say than "I love you to bits," it is not often uttered using its letters. In other words, the abbreviation ILYTB is for efficiency in writing and not efficiency in speech.